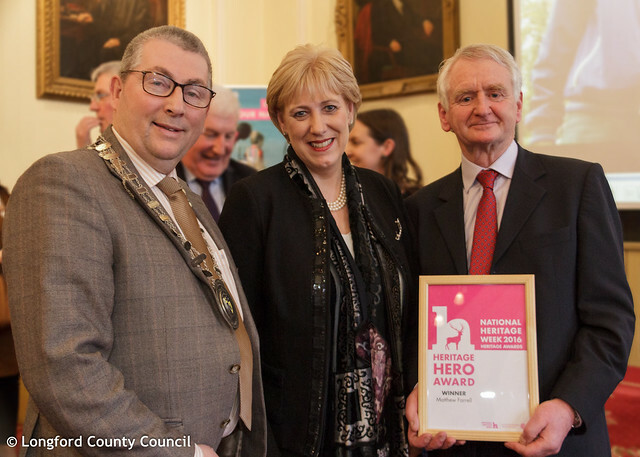 Matt Farrell of the Edgeworthstown Literary Trail and District Development Association, and who is the driving force behind many initiatives within the town, has been named the Heritage Council's Heritage Hero. Matt was presented with the honour by Minister for the Arts, Heritage, Regional, Rural and Gaeltacht Affairs, Heather Humphreys T.D., at the National Heritage Awards. This is the second time this award has been given, and it is honour of those who go above-and-beyond in promoting and preserving heritage in their local area. Matt was nominated in recognition of the many years he has given to the town of Edgeworthstown and its heritage, in particular raising awareness of the remarkable Edgeworth family and more recently the connection between the County Longford town and the famous writer, Oscar Wilde. Matt, along with his colleagues in the Edgeworthstown District Development Association and Edgeworthstown Literary Trail, has undertaken many projects to enhance Edgeworthstown including developing The Green, renovating and reusing the old schoolhouse in the town, promoting the development of a new community library, the hosting of the annual Edgeworth Literary Festival and most recently, the conservation of the Old Rectory, as part of the literary trail, which draws in tourists from all over Ireland and abroad. '"People develop a "sense of place" through experience and knowledge of a particular area. A sense of place emerges through knowledge of the history, geography and geology of an area, its flora and fauna, the legends of a place, and a growing sense of the land and its history after living there for a time." There is a tremendous community spirit in this county, and Matt has shown what can be achieved when we play to our strengths and work together. Longford County Council has been privileged to work with and support Matt's initiatives in the past, and we look forward to working with him into the future and help his dreams become a reality. The National Heritage Awards were held at the Royal College of Physicians building on Kildare Street on the 22 February 2017. Matt Farrell takes over from the inaugural Heritage Hero, Mrs. Ursula Leslie from Co. Kerry. Also celebrated at the awards were the Heritage Week awards, where organisers of events celebrating Ireland's cultural, natural and built heritage are recognised under the categories of Hidden Heritage, Reaching Out and Cool for Kids. Fore more information on the National Heritage Awards, please click here to visit the Heritage Council's website. To view more images from the ceremony, please visit the Heritage Week Facebook page. For more information on the awards and how to apply in 2017, visit the Heritage Week website.